Natural Import Company - Traditional Japanese foods - Mitoku Ume Shiso Sprinkle - 17.6 oz. 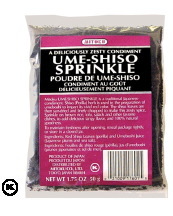 Mitoku Ume Shiso Sprinkle - 17.6 oz. Ingredients: Japanese powdered red shiso leaves (perilla), and umeboshi juice (Japanese plums and sea salt). Mitoku Ume-Shiso Sprinkle is a traditional Japanese condiment. Shiso (perilla) herb is used in the preparation of umeboshi to impart its vivid red color. Shiso leaves are sun-dried, finely chopped and added to umeboshi juice to make a zesty spice. Sprinkle on rice, tofu, salads and other favorite dishes, to add delicious tangy flavor and 100% natural goodness.